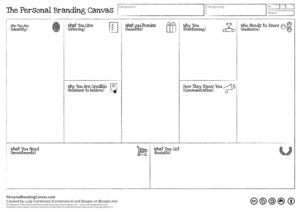 after more than a year of fine tuning and testing, we’ve published a completely new Personal Branding Canvas format. While the Canvas is new, it is also very well-oiled: we are pleased to be able to say that we’ve already used it it in many of our Professional Innovation projects in Europe and even at LinkedIn. Although BigName’s activities are 100% focused on companies and their key people (eg. CEOs, Executives, Financial Consultants, Agents, etc. ), we’ve willingly accepted invitations from dozens of universities and business training institutions. Our trips have taken us as far a field as Armenia! Also a number of organizations asked us to incorporate our Canvas into training programs for professionals such as Coaches, Lawyers, Psychologists and Architects. Graphics: now with a more modern linear style, and completely new icons. Structure: using a user-centeric design approach, we’ve reorganized the various blocks. We’ve added a few things and we’ve also simplified the graphics with a view to clarify their purpose. The new graphics now make it even easier for you to develop more efficient evaluation strategies, even when you are working on the Canvas alone. Texts: we’ve removed almost all the (remaining) technical jargon to make the canvas easy to understand for everyone. We’ve also simplified the wording of the key questions and their underlying categories. If you compare the latest version to the former 9 block format (which, if you’re feeling nostalgic, you can still download together with the new one) you’ll notice we’ve added a Skills block as well as two secondary mini-blocks: the Arena (the area in which professionals want to compete and gain visibility), and Competitors, to help stimulate useful thought on differentiation and competitive Positioning aspects. We’ve also enlarged perhaps the most motivational of all the blocks: Investments. As we often repeat, each strategic development activity on the Canvas should be rounded off with a list of what needs to be done. So you can begin testing your Personal Branding strategy. Why a new format for the Canvas? 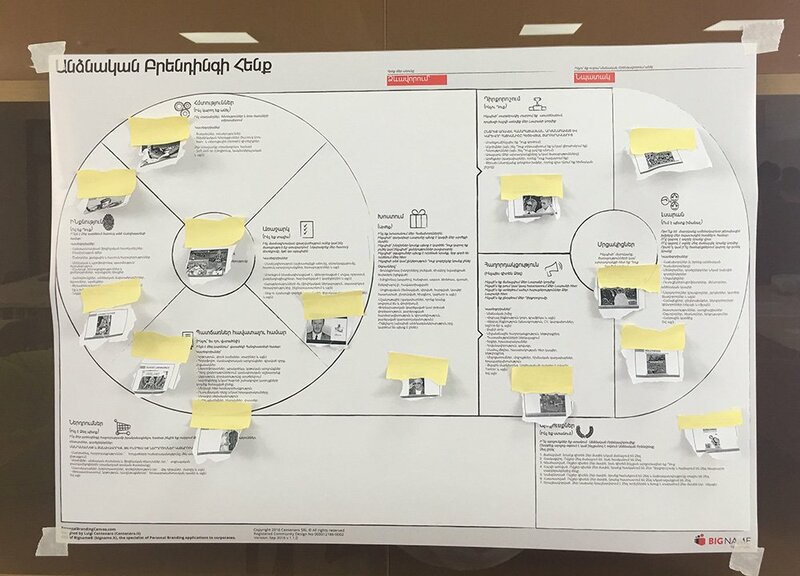 In honour of the creators of Business Model You, Alex Osterwalder and Tim Clark, we based the previous format on the Business Model Canvas. By the way both Tim and Alex suggested to adopt a new graphic format! The old version of the Canvas has been translated into many languages ​​and is used by professionals, consultants and trainers world-wide: from Hong Kong to Brazil and South Africa. They are the ones who have prompted us to innovate once again. the Results block has been radically transformed to spark you into action. 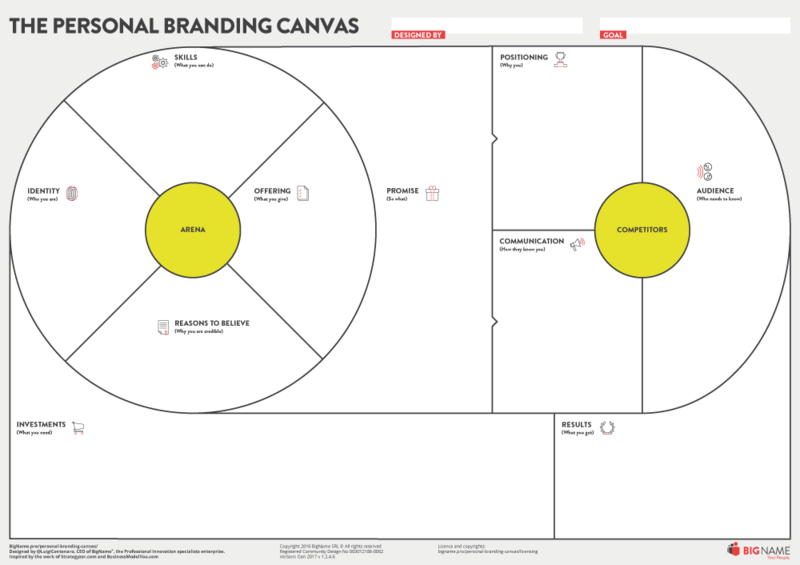 You can download the format of the Personal Branding Canvas on THIS PAGE. Please note that the new format has not been published under Creative Commons license and it is protected by Copyright (see license). in the coming months, we’ll share some of the other maps and visual thinking tools we use daily in our own projects. These will include the Team Branding Canvas we think aligns very well with Tim Clark and Bruce Hazen’s new work: Business Models for Teams (we will be the curator of the Italian version of course). We’ll strive to help as many people as possible to increase their value in the coming years. As always, we welcome your feedback, translation proposals, questions and suggestions, as these will help us make the Canvas even better!